For anyone unfamiliar with the Jian Shui process, it takes several people to produce a piece of pottery. Jian Shui is known for its dark purple clay on which most pots have designs created by carving out the surface and inlaying clays of different colour to produce caligraphy or a picture. The pieces are then burnished to produce a smooth polished surface before firing. Jian Shui clay is pourous but very hard, so some people believe it is not ideal for sheng Puer and more suited to shou cha. 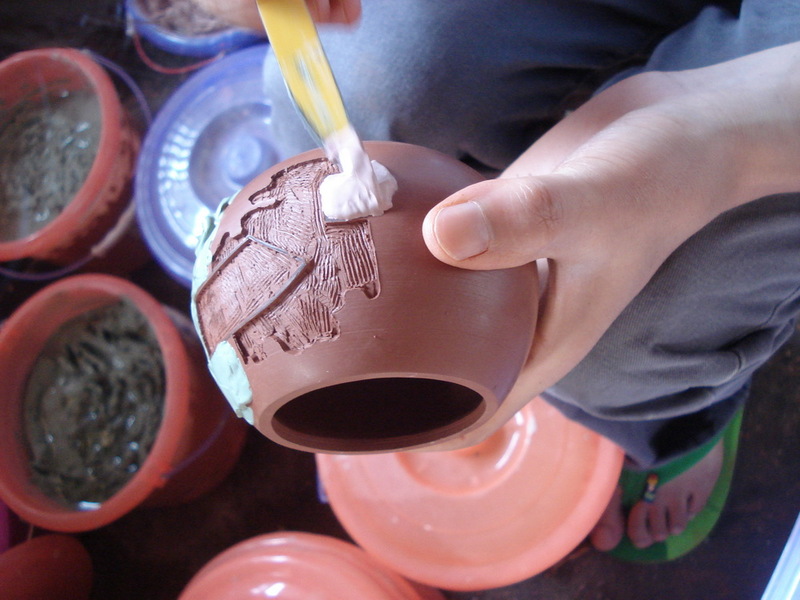 To make Jian Shui pottery requires a team of at least four or five people: throwing, trimming, carving, filling and burnishing are often all done by different people. Of course, the design work, preparing and blending the clays, and firing are also specialist skills which typically are done by yet other people. Bigger names, like Chen Shao Kang have a production line approach with large numbers of craftsmen and surprisingly large payrolls. No one person makes a piece from start to finish. Each stage requires specialist skills, though some people may well be adept at a number of them. My friend, whom I met about eight years ago, studied sculpture and is a Masters graduate in design from Yunnan Ethnic Minorities University, they work in Jian Shui as a designer. They can be contacted by email: sf9017@163.com or by phone: +86 18213453824, where you will get someone who speaks quite good English.